WARNING: BPI Keto Aminos is TERRIBLE for Keto Dieters! WARNING: THIS IS A TERRIBLY FORMULATED PRODUCT AND MAY NOT WORK AS INTENDED! See Mike's review below! 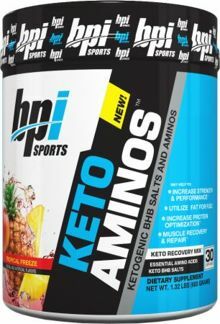 Mike's BPI Keto Aminos Review: KETOSIS KILLER! When you add this much glycine, alanine, and other glucogenic amino acids to a supplement, you will spike blood sugar so much that your body will begin to stop producing ketones. This product demonstrates a total lack of knowledge, research, and testing, and was hastily thrown together to capitalize on a growing market. BPI Sports: REFORMULATE THIS PRODUCT NOW!! !